Health care delivery is generally complicated, but it doesn’t always have to be. Change can occur through a simple step. Take the case of maternal depression. It is undisputed that depression is a highly treatable medical condition, especially if identified and treated early. It is also well-known that a mother’s depression negatively affects her ability to properly bond with and care for her child(ren). 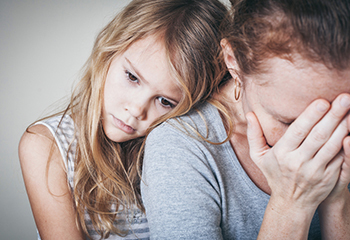 Like other forms of depression, maternal depression does not discriminate. It is widespread across socioeconomic groups and race, but research shows that poverty is a strong predictor, regardless of ethnicity. Depression interferes with work, sleep, appetite, and most importantly, a parent’s ability to parent his/her child. Maternal depression has been associated with fewer positive parenting behaviors and more negative interactions with their young children. Consequently, outcomes of children raised in a home with a depressed parent show a higher likelihood of developing behavioral problems and depression. It is also well-known that a mother’s depression negatively affects her ability to properly bond with and care for her child(ren). Yet despite all that is known about maternal depression, women – especially low-income women – often do not get the treatment they need due to fear of discussing mental health concerns with their providers or a lack of education about depression. Several weeks ago, Beacon Health Options (Beacon) issued a white paper on what the evidence shows as the best approach to behavioral and physical health care integration. In that paper, screening emerged as a critical tool. That same week, the U.S. Preventive Services Task Force found convincing evidence that screening improves the accurate identification of adult patients with depression in primary care settings, including pregnant and postpartum women. The American Congress of Obstetricians and Gynecologists has also called for more depression screening of pregnant and postpartum women and referral for evidence-based therapy. In spite of the consensus, screening for maternal depression is not standard or routine. We know that there are many models of effective collaborative/integrated care that are embedded into routine care at women’s health clinics, OB-GYN, and/or pediatric clinics, as well as targeted interventions in early childhood programs, such as home-visiting or Early Head Start programs. Various studies show that contacts in different treatment settings are potential opportunities for the screening, even if only using a two-question paper-based screen, to achieve a diagnosis of, and referral for, treatment of maternal depression. We need to conduct routine maternal depression screening during all points of possible contact, from prenatal visits through well-child visits. It’s time for screening to become routine. We need to conduct routine maternal depression screening during all points of possible contact, from prenatal visits through well-child visits. Doing so, improves detection of mothers who are willing to discuss depression and stress issues with their physician. Further, screening should be facilitated by a collaborative care infrastructure, such as discussed in Beacon’s white paper, where everyone has a role. For example, as a managed behavioral health organization, Beacon works with many of its health plan partners to address perinatal depression by collaborating on perinatal teams and screening pregnant and postpartum members with the Edinburgh Postnatal Depression Scale. In Massachusetts, Beacon’s Massachusetts Child Psychiatry Program (MCPAP) launched its MCPAP for Moms program to help physicians treating pregnant and postpartum women and their children to identify and manage depression up to one year after delivery. Another example is New York City, where a new initiative is underway between NYC Health + Hospitals and Maimonides to develop a citywide effort at universal screening and care for women experiencing material depression. In brief, screening is the logical thing to do and the necessary thing to do. We must follow New York City’s example and embrace the goal of universal screening, starting in our own communities, so that we can treat maternal depression, once and all. Although all of our children are grown adults, I still did not know at the time that my wife was suffering this until much later, and I feel like such a heel. I did not pay attention to the signs and blew it off as her being overwhelmed, or lazy or whatever. It was not until one day about 6 years ago that she had a “meltdown”, where she fell to the floor and sobbed…uncontrollably…for what seemed like an eternity, and I was scared, I had no idea what to do. I was still active duty at the time and I remember calling the only number of I could think of, Military One Source, and I believe if I had not, my wife may not be alive today. We got into counseling and that is when I learned that almost from the day our first child was born, my wife was suffering from this. And as I say, because of my ignorance, we had 4 more. But don’t get me wrong, our children were wanted, but as I say, had I known at the time, I or we maybe could have gotten some help then, but as I say, in my ignorance, I just did not understand the signs. We are doing much better now, and my wife was prescribed Zoloft and Xanax, and she is like a different person, and we talk constantly now, but there are not enough sorry’s to say nor enough guilt for me. I just wish I could have woken up and seen the signs. So let this be a lesson to anyone reading, please, please get help, before it is to late. Good afternoon Jayme and thanks for writing a comment. I am glad to know that finally you and your wife have found the needed support and services and that Military One Source was a helpful resource. Also, thank you for coming forward and sharing your story and experiences. We need to break the silence and stigma surrounding mental health conditions….the more we talk about these issues the better it will get for everyone. Good luck and keep being open and supportive of your wife and family! Great article! It’s gratifying to know that screening for maternal depression is getting the emphasis that it deserves. The integration of care described in the article heralds a hopeful trend. Hopefully, professional care providers will soon routinely screen all their clients/patients for prevalent behavioral health conditions. Also, as I read the article, in my mind I kept adding “and screening for intimate partner violence” when screening for maternal depression was mentioned. 31% of American women will suffer physical and/or sexual assault by an intimate partner during their lifetimes and violence often escalates dramatically during pregnancy and after delivery. Routine parental screening for intimate partner violence–including “lesser” forms of violence such as emotional abuse and isolation of the targeted individual–would be a great thing.